When you’re running a major enterprise business, the last thing you want to have to worry about is managing your communications system. You just expect it to work, and work well. It’s fair to say that, when you are running a Major League Baseball franchise, that sentiment increases exponentially. Not only do you have to ensure staff and personnel have a reliable communications infrastructure in place, but you are also potentially dealing with 40,000 or more customers on a daily basis who require a consistent service experience. For the San Diego Padres, running a baseball franchise is difficult enough, but, as any sports organization will attest, hosting the 2016 All-Star Game in Petco Park was a challenge at which it couldn’t afford to fail. Too much was at stake with everything All-Star Week brought with it, including the opening ceremony, Home Run Derby, the Futures Game, the High School Home Run Derby, and the game itself, kicked off by “Fight Song” singer Rachel Platten performing the Star Spangled Banner. which dated back to the ballpark’s opening season in 2004. The ensuing realization was it really didn’t have the ability to support a modern baseball team that needs to support not only its on-site staff, but also scouts, who have to stay in touch from around the globe, as well as team personnel on the road for 81 games each season, and other mobile employees who are tasked with ensuring all the aspects of team and facility management are addressed. And that’s not even considering the tens of thousands of fans who contact the Padres Call Center. Whether these fans are local Padres fans or Mets fans coming from across the country, they all expect the best in customer care. 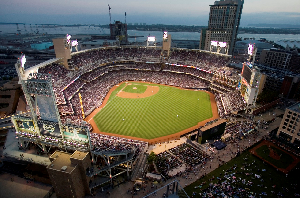 To be certain, that play wasn’t nearly as bad as it sounded at the time, and the Padres organization wanted to make sure its communications also wasn’t bad for the team, which is why the decision was taken to migrate to a cloud communications solution with contact center integrations and full Unified Communications (News - Alert) and Collaboration applications to support a next-gen organization with next-gen capabilities. Want to hear why and how they did it? Are you considering a move to the cloud and want to hear how it’s played out for an enterprise that’s done it? Are you curious about what hurdles had to be overcome and how that happened? Ray Chan, director of IT for the San Diego Padres will be talking about just that on Tuesday, September 13 during a live Webinar. Take this opportunity to hear what made the migration successful, what the results have been, and even ask Ray your own questions about the Padres’ move to the cloud. Register for the Webinar, “Exclusive IT Insights from the San Diego Padres: Mobility, Contact Center, Cloud,” today.